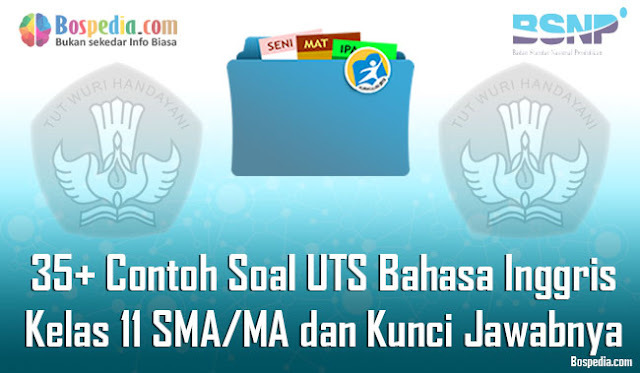 35+ Contoh Soal UTS Bahasa Inggris Kelas 11 SMA/MA dan Kunci Jawabnya Terbaru - Halo bro n sist, kali ini kakak sudah menyiapkan soal UTS untuk mata pelajaran Bahasa Inggris, Soal ini sudah kakak susun sebanyak 35 soal yang mana soal ini sudah terdapat soal pilihan gandan dan essya. Tidak perlu kawatir bahwa kakak telah menyiapkan kunci jawabannya. Oiya Sejarah Bahasa Singkat Bahasa Inggris, Bahasa Inggris merupakan bahasa ibu di Negara Amerika Serikat, Inggris, Britania raya, Irlandia, Australia, Africa Selatan, New Zealand dan Negara persemakmuran Inggris seperti Singapura dan Malaysia.Bahasa Inggris adalah bahasa Jermanik yang dituturkan pertama kali di Negara Inggris pada abad pertengahan awal.Dan saat ini sudah menjadi bahasa resmi dan paling umum digunakan di hampir 60 negara di seluruh dunia. Read the following dialogue to answer the questions number 1 to 4. Situation: Mia will invite her close friend, Julia to her Wedding Day. Julia: “I’m good. And how about you? 1. When will Mia get married? 2. Julia must come at…. if she doesn’t want to be late…. The above expression is included into the expression of…. 4. What is the dress code of Mia’s wedding? Read the following dialogue to answer the question number for 6 to 10. My name is Susan Harris and I am writing on behalf of student at Lockwood Middle School. A significant amount of the student at the school have been working on a project which relates to the unemployment problem within the youth demographic of Lockwood. You are invited to attend a presentation that will be held within the media room of the school where a variety of proposals that will demonstrate the ability of the community to develop employment opportunities for the youth within the community. At the presentation, there will be several student receiving awards which will recognized them within the community from the mayor. Refreshments will also be available at the presentation. As one of the prominent figures in the community, we would be honored by your attendance. Our special presentation will be held at our school auditorium on 16th of January. Please reply by Monday 9th of January to confirm your attendance to the function. 6. Who is the writer of the letter? c. Student of Lockwood Middle School. 7. What the subject is made a project by the Lockwood students? 8. When will the presentation be held? 9. What kind of letter is it? 10. What a day must Mrs. Colling reply the letter? The following dialogue is for number 11 to 13. 11. From the dialogue above we conclude that…. a. Kate declines the invitation. b. Pete wants to have dinner. d. Pete invites Kate to have dinner together. e. Pete make a date with Kate. 12. What the Underline sentence express? 13. Is Pete inviting Kate? Ipeh: “Yes, I want it. The dialogue uses expression of…. From the underline sentence, we know that…. a. Citra doubt to go with Coki. b. Coki ask for help to Citra. c. Coki orders Citra to go with him. d. Citra asks Coki to go together. e. Citra accepts Coki’s Invitation. The following text is for number 16 to 20. It is a great honor for us to extend this invitation to you. We would like to invite you and Ms. Rakib to celebrate our company’ Anniversary. We are going to have party to mark the tent Anniversary of PT CSL Indosejahtera. The Party to commemorate this special event will be held on 30 of June, 2014, Monday evening from 7:00 p.m. till 11:00 p.m. at Hermes Room Hermes Hotel. We hope that you and Mr. Rakib would be available to come. We eagerly look forward to seeing you both in our company’s anniversary party. 16. Where is the location of PT CSL Indosejahtera? 17. When will the party be held? 18. How old is PT CSL Indosejahtera when the party is held? 19. What is the position of Alex Manuhutu? 20. What kind of letter is it? The following text is for number 21 to 23. Our records …. (21) That you have been a customer of PJ Party Inc. since our grand opening last year. We would like to thank you for your business …. (22) Inviting you to our preferred customer Spring Extravaganza next Saturday. Saturday’s sales event is by invitation only. All of our stock, including pajamas and bedding will be marked down from 50-80% off. * Doors open at 09:00 a.m. sharp. Complimentary coffee and donuts will be served. Public admission …. (23) Commence at noon. The following text is for number 24 to 25. Each of us has different talents, different dreams, and different destination. We all have the power to make a new tomorrow with a great happiness. We, the Senior Class of Campbellsburg High School, invite you to join us School Anniversary on Friday 1st of June 2011 at 06.30 p.m. at Hamilton Auditorium Campbellsburg Arizona. 24. Where will the anniversary be held? b. In the class room. c. At the school yard. B. Read the following text and answer the questions! Language is tool of communication. Mostly groups of society have their own languages. Some of them appear to be the top global languages. Most people in the world hear about English, Arabic, and Mandarin. However, English is the most global spoken language. Then if a man wants to catch a global goal, he has to master English. Everyone recognizes that English is an international language. English is used in writing and speaking by many people all over the world. It can be either as a first or second language. We even hear British, American, Australian, and even Singaporean English. Those various names of English are used as the first language in those countries. Furthermore, some countries have their own languages, as mother language but also use English mostly in daily communication. Besides the usage in daily interaction, English is also used as a key to open doors leading to scientific and technical knowledge. No wonder we find manual guides and instruction of many devices written in English. Even if we have a pack of instant noodle, we will see the cooking instruction also written in English. This transfer of science and technical will include many countries in economic, social and politics development. 26. The function of language is…. Answer: as tool of communication. 27. The most spoken language in the world is…. 28. The English accent mentioned in the text above…. Answer: British, American, Australian, and even Singaporean English. 29. English has another function besides communication, which is…. Answer: open the doors toward scientific and technical knowledge. 30. The main Opinion of the text above is…. Answer: English language is important to be learned. Read the following dialogue and then answer the questions! 31. What did Joni feel? 32. Did Joni have a homework? 34. What was Joni’s suggestions to Jono? Answer: To get some rest. 35. Mention one expression of giving invitation based on the dialogue above! Answer: Could you come to my home tonight? Demikianlah informasi yang bisa kami sampaikan, mudah-mudahan dengan adanya 35+ Contoh Soal UTS Bahasa Inggris Kelas 11 SMA/MA dan Kunci Jawabnya Terbaru ini para siswa akan lebih semangat lagi dalam belajar demi meraih prestasi yang lebih baik. Selamat belajar! !